Multiflight stair climbing the heights in Glasgow. A multiflight stair in a triple height space in a Glasgow new build property. 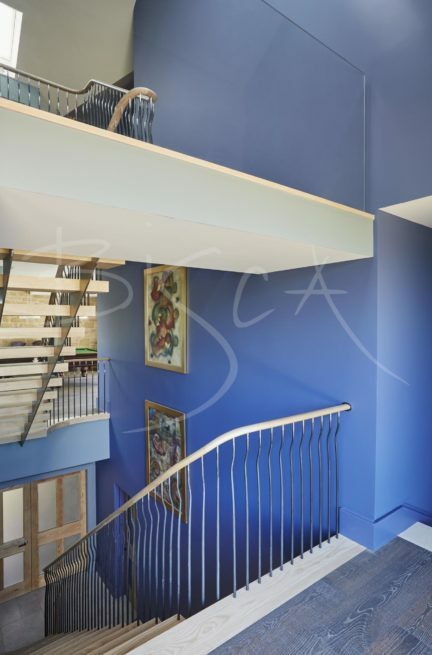 Bisca had already designed the main staircase in this property. Continuity of both staircases in their respective spaces were a very important part of the client’s brief. They were also keen to understand how the staircases would interface with the building as they understood the impact of interfaces on any design. A major consideration was that the staircases were linked aesthetically by common design details. 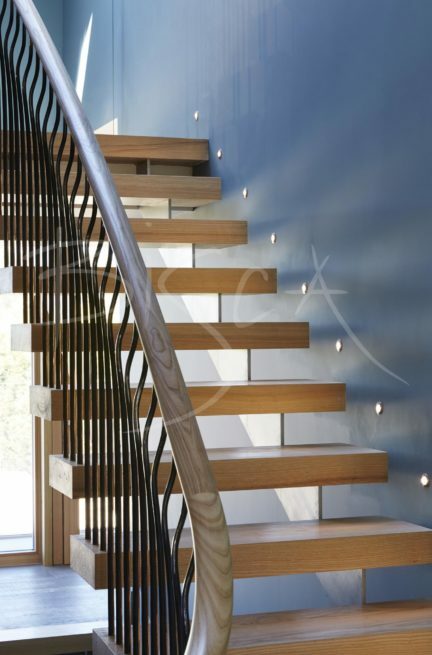 Our design is a staircase of solid Ash treads supported by exposed, brushed stainless steels stringers. The open rise staircase is designed to sit slightly away from the wall, thus maximising light flowing down through the space. 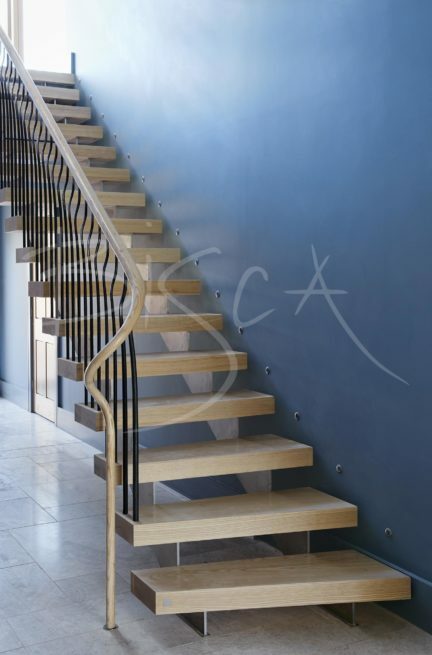 At the foot of the staircase is a helical timber newel of hand carved and polished Ash. 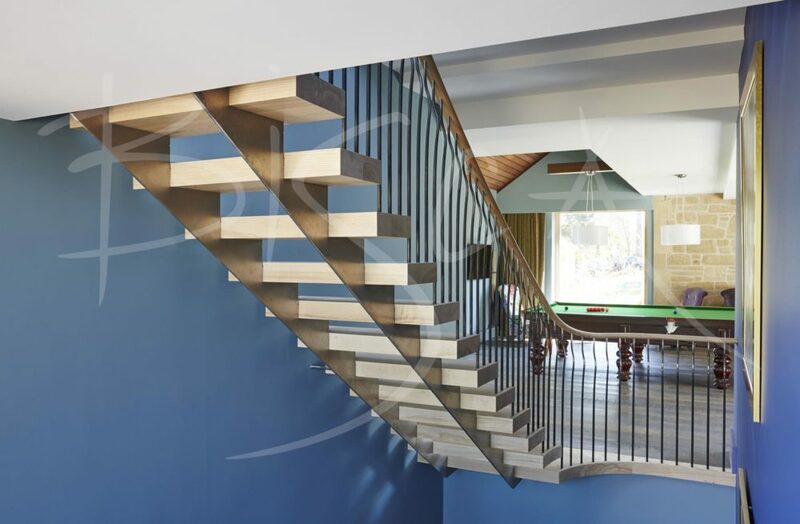 The newel transitions seamlessly into an oval, timber handrail travelling up and around the landing edges in one continuous sweep. The handrail is supported by forged formed uprights made by our blacksmith. This form detail effectively adds interest to the balustrade whilst increasing the width of the stair at the handrail. The design of the upright is based on the uprights used for the main staircase in this property. 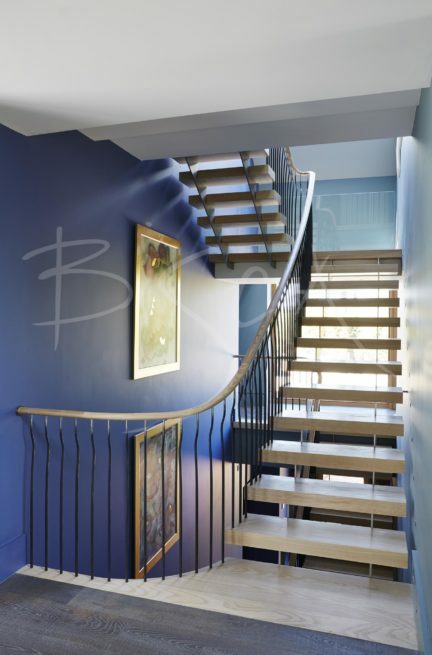 For the main staircase in this property, see project reference 4342 Glasgow Stone Cantilever.